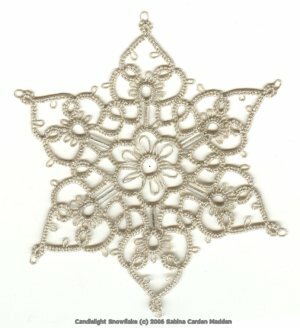 I have designed this snowflake pattern in further developing Matthew Takeda's original SSSR technique in whole new way for my own personal enjoyment and use in my designs. This technique I will for the time being refer to as a Loop Tatted Ring or LTR in upcoming designs to avoid confusion because it is NOT used as a split ring at all but a means to make a ring through a bead(s) and continue uninterrupted with your work element be it chain or ring!! 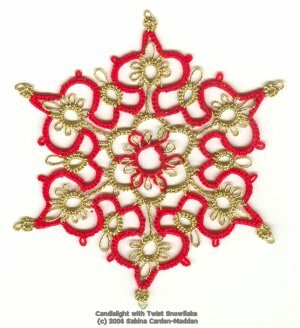 In this case I used Bugle beads to illustrate the use of the technique in this fashion, creating the effect of candles with flames in the tatting. You may use stacked seed beads in place of the bugle beads. The candle stick being the bead(s) and the flames the ring with 1/8" open measured decorative picots. The floral center uses 1/4" closed measured picots. A split chain of 4 ds climbs out of the second round to the third along with mock picots in the silver rendition. In the second model, I show the another method to create the candles not using the SSSR/LTR technique, instead twisting the threads (4 times 5/8" thread length)that leads into and out of the flame ring and a shorter point (omitting the picot and 8 ds in the diagram) to highlight the larger flame picot in the candle. R: 2 - 2 - 2 - 2 - 2 - 2 - 2 - 2 - 2 - 2 - 2 - 2 (11 picots each 1/4" closed measured) climb out with mock picot. To prevent twisting, make the mock picot first half, second hs not flipped, and second half stitch flipped and use the knot as your first stitch of the next chain. Ch: 4 - 2 , bugle bead, pull loop of S2 through bugle bead and use the loop to make the next Ring. R: 2 - 2 - 2 - 2 - 2 - 2 - 2 - 2 - 2 - 2. (9 picots each 1/4" open measured) Using a loop of the hand ring make the entire ring with a doubled core instead of just half can close by bringing the loop over the ring and drawing the slack of the loop through the bugle bead. The loop tats the whole ring not the shuttle. The shuttle is dangling from the base of the bugle bead. 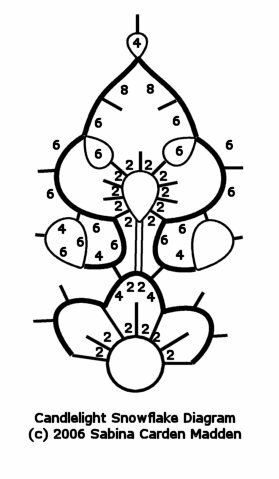 Ch: 2 - 4 (skip one 1 picot on first round R and join to next picot with shuttle lock join) 4. Repeat until every other picot in the first ring has been joined to. Make last chain including bugle bead with its Ring, 2 ds and a split chain of 4 ds to climb out to next round with 1/8" mock picot. Repeat from * until 6 points are created and chain meets the original climb out point. Cut, tie and hide to preference. As a variation you may omit the bugle beads and use a twisted picot 5/8" closed measured and twist it four (4) times, be mindful that the right is facing the right side of the work when joined, if you work directionally. The points may be shortened by omitting the half the stitch count in the chain to reflect the second model shown. The more you use any technique the more you can be inspired by its mechanism to try new and different things. In this case I sought to find a use for bugle beads since I am really not fond of them in the first place, this allowed me to include them in a fun way for my personal design style. I hope it inspires you too to play! Any questions regarding the pattern, please feel free to contact me for assistance.